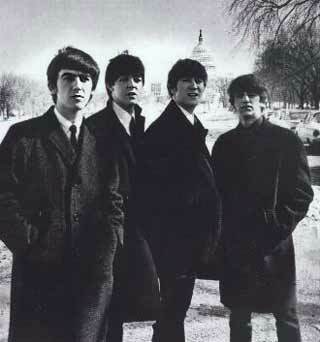 The Beatles performance in Washington D.C. was filmed and later shown in American theatres in March 1964 as a closed-circuit video feed. The film has recently been available on DVD. This television interview was filmed on-stage with the Beatles just after their press conference and just before doors were opened to the pubic for their Washington Coliseum performance. The mention of "The Johnson Girls" refers to the daughters of then-President Lyndon B. Johnson. Q: "Here I am surrounded by Beatles and I don't feel a thing. Fellas, how does it feel to be in the United States?" PAUL AND GEORGE: "Very nice!" Q: "What have you seen that you like best about our country?" Q: "Thank you very much. I'll take that under advisement. Now, do you have any plans or any arrangements to meet the Johnson girls?" JOHN: "No. We heard they didn't like concerts." GEORGE: "I didn't know they were on the show!" Q: "They may come.... Are they coming to your show tonight?" PAUL: "We're not sure. But if they do, you know, we'd love it." RINGO: "We'd like to meet them." Q: "You and the snow came to Washington at the same time today. Which do you think will have the greater impact?" JOHN: "The snow will probably last longer." RINGO: "Yeah. We're going tomorrow." Q: "Have you ever heard of Walter Cronkite?" JOHN: "Good old Walter! NBC News, isn't he? Yeah, we know him. See? You don't catch me!" GEORGE: "I know, but I didn't want to say it. 'Cuz I thought it was CBS." GEORGE: (to John) "We're doing ABC..."
GEORGE: "The other fella is on CBS, and the other one is NBC." Q: "This is NBC, believe it or not." JOHN: (jokingly) "What's going on around here!!" Q: "I don't know! So, we're all together here." Q: "What do you think of your reception in America, so far?" Q: "What struck you the most, so far?" PAUL: "YOU!! (laughing) We won't do that one again." RINGO: "When we first came in, you know--- The airport. We never expected nothing like that. It was great." Q: "You mean the crowds?" JOHN: "It knocked us out!" Q: "In spite of the snow, you still got a good crowd?" JOHN: "Great crowd, yeah. I don't know-- Half of them thought we were coming by air, and we came by train." Q: "Tell me this. Why do you think you're so popular all of a sudden?" JOHN: "I don't know. It must be the weather." PAUL: (giggles) "We've no idea at all why. Really." Q: "Do you think it's your singing?" JOHN: (Operatic singing voice) "Eeeeeee Dhhooooo!" PAUL: "I doubt it. It could be alot of things, and we don't know which it could be." Q: "Where did you get the idea for the haircuts?" PAUL: "We didn't. It just the way we..."
RINGO: "Where did you get the idea for yours??" PAUL: (laughs) "No, it's just something that we liked. We enjoyed wearing our hair this way, so it's developed this way." Q: "You save on haircutting, at least?" PAUL: "Yeah, uhhh-- We're saving." JOHN: "I think it costs more to keep it short than to keep it long, don't you?" Q: "I don't know. I imagine." PAUL: "Yeah. We're saving our money." Q: "Well, where do you go from here?" PAUL AND JOHN: "New York." GEORGE: "Then Miami at the weekend, just for the next Sullivan show, and then we go home." Q: "Are you still number one in Europe?" JOHN: "Well, Europe is alot of countries." Q: "Where are you number one then?" GEORGE: "We're now number one in America and England." JOHN: "Hong Kong and Sweden..."
GEORGE: "Australia, Sweden, Denmark, Finland, France..."
Q: "And you haven't any idea why?" RINGO: "We lay down and do it." JOHN: "We're coming out in Hong Kong and suddenly you're number one there years after so many records. Even here, you know, we've got records we've forgotten." Q: "You call your records 'funny records'?" JOHN: "They're funny once we've forgotten them." GEORGE: "You know-- It's unusual because they've been out in England for over a year. Like "Please, Please Me" is a hit over here now, but it's over a year old, you see. And it's funny." Q: "But, what I'm saying is-- Do you think of your records as funny records?" GEORGE: "We think it's funny-- peculiar-- that they should be hits after such a long time." Q: "Do you feel they're musical?" JOHN: "Obviously they're musical because it's music, isn't it! Instruments play music. It's a record." PAUL: "It's musical, you know." PAUL: "It's music, isn't it! (sings) 'Bumm Bumm Bumm.'" PAUL: "He's good-- He knows music!" Q: "Alright, but what do you call it?" PAUL: "We try not to define our music because we get so many wrong classifications off it. It's no use. We just call it-- MUSIC??? (laughs) ...even if you don't." Q: "With a question mark." Q: "With a question mark?" JOHN: "We leave that to the critics." PAUL: "With an exclamation mark!" Q: "OK. Have a good time in America." PAUL: "Thank you very much." JOHN AND GEORGE: "Thank you."